Harvard Business Review published an article recently by Benjamin Edelman called “Mastering the Intermediaries” which gives advice to businesses trying to avoid some of the consequences of audience aggregation and control by an intermediary. The article was aimed at restaurants who don’t want their fate controlled by Open Table or travel companies who don’t want to be beholden to Expedia. The advice offered is, of course, scholarly and thoughtful. It seemed worth examining whether it might have any value to publishers suffering the growing consequences of so much of their customer base coming to them through a single online retailer. The author presents four strategies to help businesses reduce their dependence on powerful platforms. The first suggestion: exploit the platform’s need to be comprehensive. The author cites the fact that American Airlines’ strong coverage of key routes made its presence on the travel website Kayak indispensable to Kayak’s value proposition. As a result, AA negotiated a better deal than Kayak offered others or than others could get. Despite some suggestions in the late 1990s that publishers set up their own Amazon (which they subsequently half-heartedly tried to do with no success) and a couple of moves to cut Amazon off by minor publishers that were minimally dependent on trade sales, this tactic has never really been possible for publishers on the print side. Amazon began life by acquiring all its product from wholesalers — primarily Ingram and Baker & Taylor — before they switched some and ultimately most of its sourcing to publishers to get better margin. But the publishers can’t cut off the wholesalers without seriously damaging their business and their relationships with other accounts, and the wholesalers won’t cut off Amazon. So for printed books, still extremely important and until just a couple of years ago the dominant format, this strategy is not worth much to publishers. However, the strategy was and is employable for ebooks, which are sold via contractual sufferance from agency publishers, even if the sourcing is (sometimes, not typically by Amazon) through an aggregator. That was the implied threat when Macmillan CEO John Sargent went to Seattle in the now-famous episode in 2010 to tell them that ebooks would only be available on agency terms. Amazon briefly expressed its displeasure by pulling the buy buttons off of Macmillan’s print books. (Publishers can’t cut them off from print availability, but they can cut publishers off from print sales!) In the meantime, Amazon’s share of the big publishers’ ebook sales has settled somewhat north of 60 percent, and those Kindle customers are very hard to access except through Amazon. This is considerably more share than Kayak had when American Airlines threatened their boycott. In fact, it is likely that Amazon could live without any of the Big Five’s books for a period of time, except for Penguin Random House, which is about the size of the other four big publishers combined. The chances are that PRH’s size will prevent Amazon from treating them the way they are now treating Hachette. And the massive share that Amazon has of both print and ebook sales makes it extremely difficult for Hachette, or any other big house except PRH and possibly HarperCollins, to sustain an ebook boycott (with consequent print book sales reductions) for any significant length of time. In other words, for publishers dealing with Amazon, this horse has left the barn. 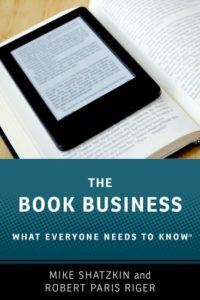 Where it has not yet left the barn is with the ebook subscription services, and for them many publishers actually appear to be following the strategy being suggested here. Only two of the big houses have put titles into Scribd and Oyster, and it appears that they got extremely favorable sales and payment terms in order to do so. Indeed, these fledgling subscription offerings must have the big houses’ branded books to have a compelling consumer proposition. The second suggestion is to identify and discredit discrimination. The HBS piece cites the complaints that eBay was giving search prominence to suppliers who advertised on the site forcing a reversal of the policy. Although the search algorithms on powerful platforms are ostensibly geared only to give the customer what they’re most likely to want, it is probably generally understood that these results are jiggered to favor the platform’s interest. It is not surprising that Google has underwritten White Papers from UCLA professor Eugene Volokh and from Supreme Court nominee Robert Bork defending that conduct. Volokh argues that the first amendment prevents the government from interfering with search results and Bork says nobody is harmed if Google favors its own interests. Could we apply that same logic to Amazon? How about this scenario? Amazon is well on its way if not already past the point where they sell more than half of the books Americans buy (combining print and digital). Book consumers are highly influenced by the suggestions made and choices surfaced by their bookseller, whether physical or virtual. That is: the process of buying books is inextricably linked to the process of discovering books. So Amazon is getting a stranglehold on recommendations which for many consumers also means a stranglehold on marketing and promotion. The “damage” to society that results from results being gamed in fiction is probably minimal, and restricted to Amazon promoting either its own published titles, its favorite self-published authors, and books from other publishers that have paid to play. But, with non-fiction, the consequences could be much more severe and of real public interest. Imagine a persuasive book arguing that the government should sharply increase the minimum wage and let’s also imagine that Amazon corporately doesn’t like that idea. Is it really okay if they suppress the awareness of that book from half or more of the book-buying public? This is the kind of an argument that can arouse the government which, so far, has shown scarcely more interest in Amazon’s dominance of book commerce than they would if they dominated the commerce in soft drinks or lawn fertilizer. Can they be awakened by publishers to this concern before dramatic cases affecting public awareness and policy are documented? We don’t know, but we do know that Hachette sent lawyers to Washington early in the Obama Administration to call attention to Amazon’s growing marketplace power and their willingness to use it. That apparently had no affect (unless, in some perverse way, it contributed to the government’s interest in pursuing the “collusion” case). There could certainly be some consumer blowback to the gaming of search results by a platform, perhaps including Amazon. The Harvard article says Google changed algorithms that seemed to be burying Yelp because consumer sentiment, partly measurable in search queries, showed dissatisfaction among the public. But in the absence of an aroused government, it would seem unlikely that this suggestion will do publishers large or small much good. It is definitely worth noting here that Hachette authors are involved in just such an effort right now over the current Hachette-Amazon dispute. (And Amazon authors, also often called “indie authors”, are pushing back in the other direction.) There is a difference of opinion about how much this is “hurting” Amazon or whether it will push them to a quicker resolution of the dispute; I’m not sure anybody will ever know the answer to that. The third suggestion is to create an alternative platform. As the piece explains, when MovieTickets was on the verge of dominating phone and online ticketing, Regal Entertainment and two other large theater chains formed Fandango. Unfortunately, this is a strategy that simply won’t work as an antidote to Amazon. In fact, trying it, which publishers have, demonstrates a failure to understand the source of Amazon’s power in the marketplace. Amazon’s strategy is in plain sight and is the title of the best and most recent book about them: Brad Stone’s “The Everything Store”. Books had a central role in getting Amazon started, but have now declined to very likely less than 10 percent of their revenue and far less of their operating margin. Books are strategic for Amazon, but not commercially fundamental. This is one of the reasons, perhaps even the principal one, why they operate their book retailing on margins so thin that the incumbent book retailers can’t match them. After all, B&N can’t make up the margin shortfalls created by offering books cheaply by selling that same customer a lawnmower. Nor do they benefit from additional scale provided by selling lawnmowers or cat food or server space. The fact that Amazon did book retailing in a thorough and sophisticated way as they established their business to become an online Walmart made them different from omni-retailers in the past (going back to departments stores a hundred years ago) who sold some books. The story has been told on this blog before about Amazon cutting prices more than fifteen years ago to discourage competition coming into the market. Although publishing is a profitable business for them, it is also a strategic component of larger objectives: getting an increasing share of its customers’ purchases across a range of physical products as well as to compete as a streaming content provider across the entire range of digital media. No enterprise focused primarily on books can compete with that. Amazon takes too many customers off the table before whoever else is competing gets to begin and keeps them for a wide range of reasons. They’ve got the most admirable competitive position conceivable: a first-class operation supported by scale provided by myriad other enterprises, totally wide-ranging and broad knowledge of the details of book retailing, and the financial heft to accept diminished (or even negative) margins from time to time to support strategic objectives. This is probably the 20th year in a row, dating from their start in 1995, that Amazon has gained market share for sales of books to consumers. And that’s because consumers are making what for them is the obvious choice for convenience, total selection, and competitive pricing, as well as getting tied into Amazon through their PRIME program. Unless one of the other two tech giants in the bookselling world — Apple or Google — decides to make a dedicated effort to take some of that market share away from Amazon in both print and digital (and neither of them is much interested in print), it is hard to see where a serious competitor can come from. As of this moment, there is no way for any ebook retailer except Amazon to put DRMed content on a Kindle, which eliminates a big part of the audience from play for any competitive platform. The fourth suggestion: deal more directly. The article points out that people ordering takeout through online platforms like Foodler and GrubHub have often already chosen their restaurant so that restaurants that deal directly can afford to exit the platform. As I was working on this post, HarperCollins announced that they have redesigned their website to be consumer-facing which enables them to sell books directly to consumers. They’ve collaborated with their printer-warehouse partner, Donnelley, to handle print book fulfillment and have a white-label version of indie ebook platform Bluefire to deliver ebooks. They promise that authors will be able to use the capability very easily to connect their own web presences and they’re thinking about additional compensation to authors that generate those sales. This bold move has a hole in it, though, and it is one that publishers so far have no easy way to fill. All the non-Amazon platforms use Adobe DRM, which HarperCollins/Bluefire supports, so they can put your ebook on a Nook or Kobo device with copy-protection. Of course, they have their own “reader”, which can be loaded with ease on most web-capable devices and can apparently also be squeezed onto a Kindle Fire. But, because HarperCollins wants to continue to use DRM protection for the content, they won’t be able to sell directly to users of Kindle devices that are dedicated e-readers. Although publishers have certainly encouraged that competition to Amazon which exists, their direct efforts have for the most part been limited to cultivating direct interaction with the end user audience to influence awareness and selection. Many smaller publishers are willing to sell direct without DRM and other large publishers sell direct in a more restrained way, but this seems to be the first concerted effort by a major player to drive direct sales. But HarperCollins doesn’t need to get a big volume of direct sales for this to be a worthwhile initiative for them. I’d expect it to be copied. Any sales they can get directly increase their power in the marketplace. There is one other initiative we’re aware of that can perhaps help publishers disintermediate Amazon for direct sales. That’s Aerbook, which widgetizes a book or promotional material for a book so that it can be “displayed” in any environment. Aerbook’s widgets can contain the capabilities for transacting or for referring the transaction to a retailer, Amazon or anybody else. Putting the awareness of the book directly into the social and commercial streams can be a big tool for authors and publishers. But even Aerbook can’t put a DRMed file on a Kindle. They offer a version of “social DRM” — essentially “marking” the ebook in a way that identifies its owner — which can be loaded onto the Kindle. But big publishers and big authors have apparently not yet come to a comfort level with that solution; perhaps the need to get to the Kindle customer directly and the experience Aerbook develops with their method will encourage a more open mind on that question over time. So, it would seem, the best thinking presented by Harvard Business Review for how producers and service providers can dodge platforms trying to lock in their audiences has precious little that can be usefully applied by publishers to escape the grip of Amazon. Having taken about half the retail book market over the two decades of their existence, they have given themselves a reputation, tools, and momentum that will make it very hard to stop them from eating into the other half substantially in the years to come. The fact that competing with Amazon is difficult doesn’t stop smart people from trying to figure out how it might be done. A group of publishing thinkers are holding a 2-day brainstorming session at the end of this month to come up with ideas. Two of them, Chris Kubica and Ashley Gordon, will be presenting at a session at Digital Book World in January called “Blue Sky in the ebook future”, which will include thoughts on how to improve the narrative ebook itself from Peter Meyers and somebody not yet chosen to speak about complex ebooks.